Following the eviction of Big Brother Naija 2018 housemates, Khloe and Anto, details of how Nigerians voted have emerged. 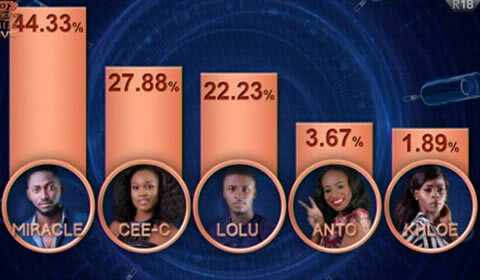 Miracle had the highest percentage of votes while Anto had the least. Anto with the least votes got evicted in today (Sunday) night’s live eviction show.